The Hope College Knickerbocker Fall Film Series is presenting “Still Mine” through Saturday. 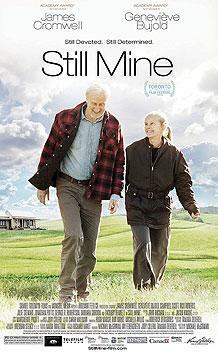 Based on true events and laced with wry humor, “Still Mine” is a heartfelt love story about an 89-year-old New Brunswicker (James Cromwell) who comes up against the system when he sets out to build a more suitable house for his wife (Geneviève Bujold), whose memory is starting to go. Although Craig Morrison is using the same methods his father, a shipbuilder, taught him, times have changed. Craig quickly gets on the wrong side of an overzealous government inspector, who finds just about everything unacceptable, including the unstamped wood Craig has milled from his own trees. As Irene becomes increasingly ill and amidst a series of stop-work orders, Craig races to finish the house. Hauled into court and facing jail, Craig takes a final stance. The showing begins nightly at 7:30 p.m.
Tickets for “Still Mine” are $6 for regular admission and $5 for senior citizens, Hope College faculty and children. Tickets will be sold at the door but are also available in advance at the ticket offices in the main lobby of the DeVos Fieldhouse (222 Fairbanks Ave.) and the Events and Conferences Office located downtown in the Anderson-Werkman Financial Center (100 E. Eighth St.). Both offices are open weekdays from 10 a.m. to 5 p.m. and can be called at (616) 395-7890.